Comic Yianni Agisilaou has turned the tables on a scam artist who tried to sell him non-existent tickets to his own show. The stand-up’s interest was piqued when he spotted the tickets for his show – The Simpsons Taught Me Everything I Know – at Fringe World in Perth on Facebook. So he got in touch with the fraudster, who was using the name Jordan Bricks, pretending to be interested in two tickets for Friday – a day when Agisilaou was not even performing the show. 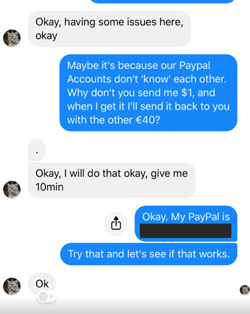 Agisilaou, who is Australian but based in London, then strung ‘Jordan’ along by pretending to send money by PayPal, but suggesting there were technical issues in getting it through. At one point in their exchange – which he chronicled on his Facebook page – the comic tried to send the conman 0.01c, so he could use the receipt to mock up a fake for the full amount. 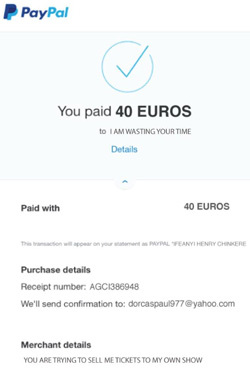 But that generated an error message – which Agisilaou screen grabbed to ‘prove’ he had tried to make the full €40 payment. Then came the sting. Agisilaou suggested the issue was because ‘our Paypal accounts don’t "know" each other’ – so asked for $1 to be sent to him. He then returned to his plan to fake a receipt using Photoshop for the full €40. But on it, he wrote that the cash was to ‘I AM WASTING YOUR TIME’ adding further down ‘YOU ARE TRYING TO SELL ME TICKETS TO MY OWN SHOW!’ But the scammer did not notice these telltale signs. The exchanges continued with Jordan complaining about not getting paid, but accepting Agisilaou’s explanation that PayPal was playing up. But they remained on friendly terms, with Yianni saying he was going to the show with his girlfriend - ‘a big fan’ – and that they were getting married soon. ‘Jordan’, who is believed to be in Nigeria. forwarded a picture from their exchange and Carrie said: ‘THAT’S HIM! Oh I feel bad now! For doubting him getting the tickets. Yianni then returned to his conversation, suggesting he was going to give up and get tickets for something else instead. But ‘Jordan’ talked him into sticking with it, saying: ‘It would be really good if you surprise her with these, I really want everything to work out okay I like people who are looking to start up a lifetime relationship. It gives me joy and I always want it to work. 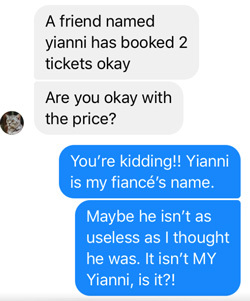 After more faffing about with a non-existent gift card supposedly used to transfer the money, Yianni came clean saying: ‘You are trying to sell me tickets to MY OWN SHOW, that I am performing, on a night were there is no show… Pretty sloppy work. ‘You are a swindler, taking advantage of people’s good nature’ – and confronted the con artist with what he believed to be his real name. The scam account then closed down.